“Ascension” is a spiritual evolutionary process that is being experienced currently on the planet. On an individual soul level it is a raising from the human to the heavenly/cosmic or angelic realms. On the planetary level it is a raising of our collective consciousness from I/earth/humanity-centered to We/cosmic-extended extraterrestrial family centered. For some there is a great deal of confusion, and sometimes fear, around this phenomena. There shouldn’t be. This is a natural metamorphosis or transfiguration…and we’ve only just begun. The questions that follow are derived from various interviews, conference panels and emails. The thoughts I share are based on over 20 years of academic study, contemplation and merging of the ancient beliefs and practices of ascension and human transformation into higher beings. For more details, please see my books, The Watchers : Lost Secrets of Ascension, Resurrection and Perfection and The Secret of Sion: Jesus’s Stargate, the Beaming Garment and the Galactic Core in Ascension Art. Or, join us in Nashville, April 14-15, 2018 for ((( CONVERGENCE ))) Ascension and & Light Body conference. Humanity has been called “a species with amnesia”. What have we forgotten? Has this to do with ascension? What we have forgotten is our true nature and the beginnings of our spiritual predicament. 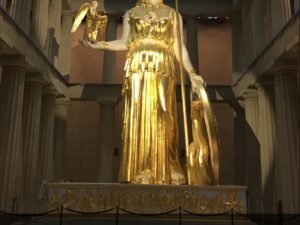 Whether we realize (or acknowledge) it or not, western civilization, our culture, is based on the Judeo-Christian premise that the actions of Adam and Eve, the first humans, are responsible for our current spiritual malaise. Even if you don’t believe they existed, their archetypal story is still the guiding narrative of our times (or End Times, according to some). Civilization began with Eden and ends with the return of Christ and our ascension to, or unification with, a celestial realm (the Kingdom of Heaven) that completely transforms earth and introduces a time when all live with righteous values and, hence, have expanded spiritual capabilities. Adam and Eve flank Christ on the Tree of Sapphires or Tree of Life. Edward Burne-Jones. Ascension, or attainment of our original light body, is symbolized by this white robe. For example, in the story of Elijah’s ascension we learn that as he was being translated into his light body form, and transported to heaven via a celestial chariot, he transmitted his robe of righteousness to his priest, Elisha. On earth, this robe, or the teaching it symbolized, enabled Elijah to perform miracles. His acquisition of this glorious body and luminous garment signals transition from an earthly being to a celestial being. In order to enter the heavenly realms we must be dressed appropriately. 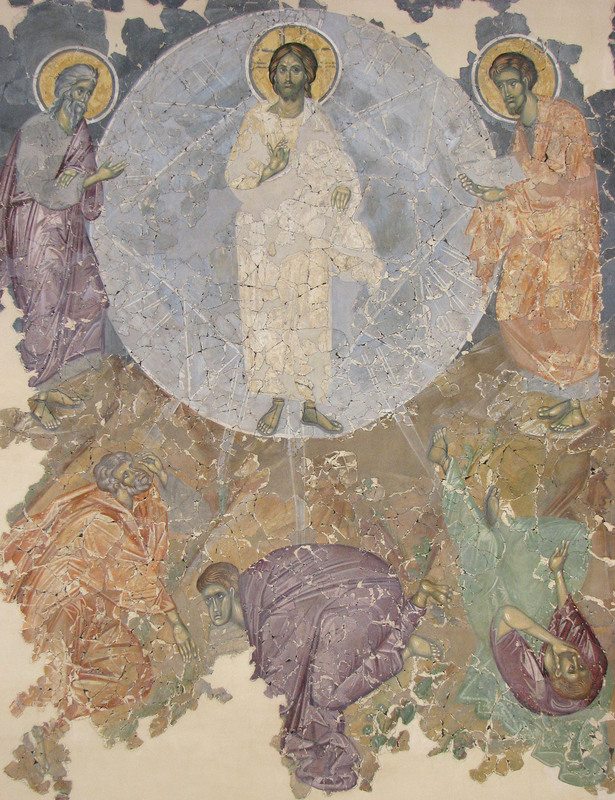 Later, when Elijah reincarnated as John the Baptist, he re-attained the robe of light and transferred it to Jesus at the baptism, who demonstrated what I call “the light body effect” at his Transfiguration when he morphed into light. 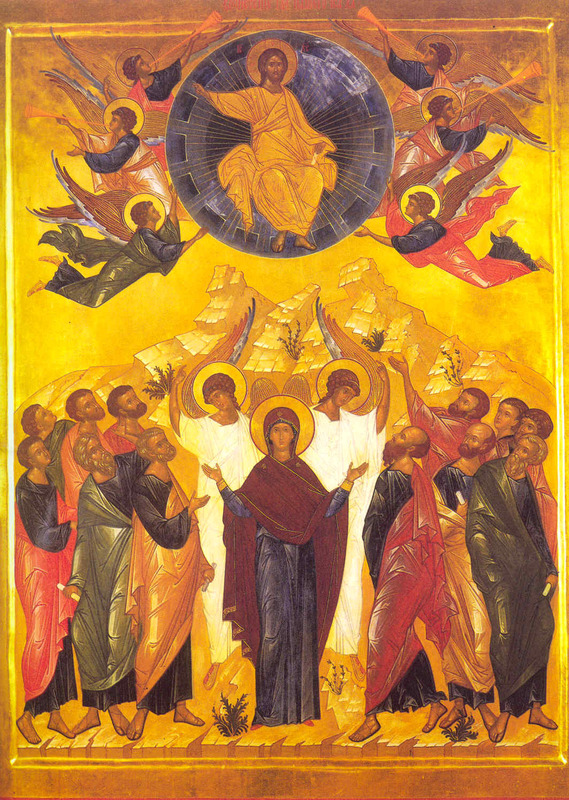 The ascension of Elijah. Russian icon. 16th c.
John the Baptist transfers the Holy Spirit to Jesus. An angel gives the Robe of Light to Jesus. 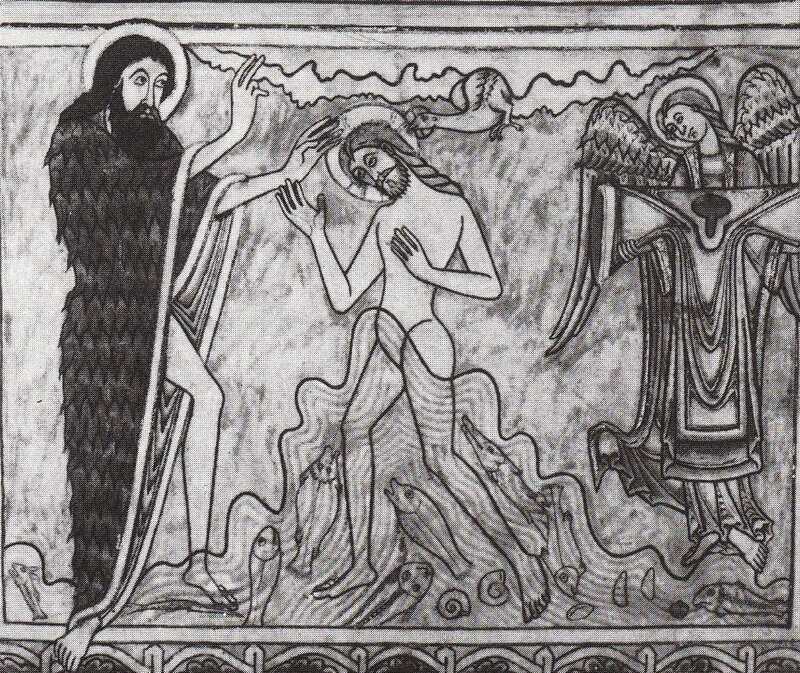 The Transfiguration of Jesus, ca 1380. All human growth and development is aimed at returning humanity to this pure state of being, our original state of perfection and existence in our light bodies. 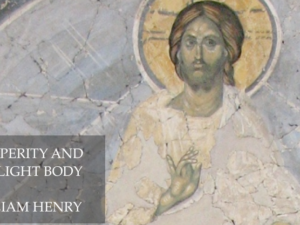 Ascension is the awakening and raising of our collective consciousness, a quest for wholeness and holiness, that leads to the transformation (perfection) of the body from its material/solid flesh form into its original subtler light body form. It is attained through the fruits of the tree of life and the holy spirit or the higher self (more momentarily). As I discussed in The Secret of Sion Merkaba mysticism was the foundation of early Christianity, and was prominent in its art, but was removed when Christianity shifted from an ascension movement to a religion. I further discuss the “blue ascension spheres” here. 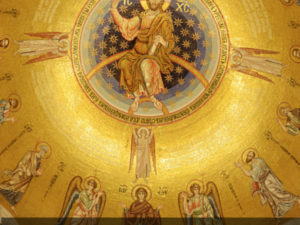 Technically, as a personal choice, ascension is a heresy (or hubris) to mainstream understanding of Judaism, Christianity and Islam at it implies that the soul can choose its time of ascension, rather than God choosing it for us. Becoming peacemakers is essential to hitting this key. One can only see God once they have risen to a level of peace. This, of course, suggests a shift in vibration. The Greek word for “pure” in Matthew 5:8 is katharos. It means to be “clean, blameless, unstained from guilt.” Interestingly, the word can refer specifically to that which is purified by fire or by pruning. John the Baptist told people that Jesus would baptize with the Holy Spirit and fire (Matthew 3:11). Malachi speaks of the Messiah as being like a “refiner’s fire” (Malachi 3:2). The inscription, “INRI”, placed above the cross of crucifixion is esoterically translated as “By fire humanity is renewed or made whole (holy)”. Fire symbolizes frequency or vibration. So, once again, we are talking about a shift to a higher octave or dimension. The Greek word for “heart” in Matthew 5:8 is kardeeah. This can be applied to the physical heart. But it also refers to the spiritual center of life. It is where thoughts, desires, sense of purpose, will, understanding, and character reside. So, to be pure in heart means to be true in who we actually are…and to have higher vibration thoughts. 3D is a term for our physical body and the material ‘world’ of duality and love and fear. It is characterized by physicality and a lag time between thought and action, as well as choosing love over fear. Beyond the dream realm is a plane of unconditional light where all is love. This is 5D and 6D. 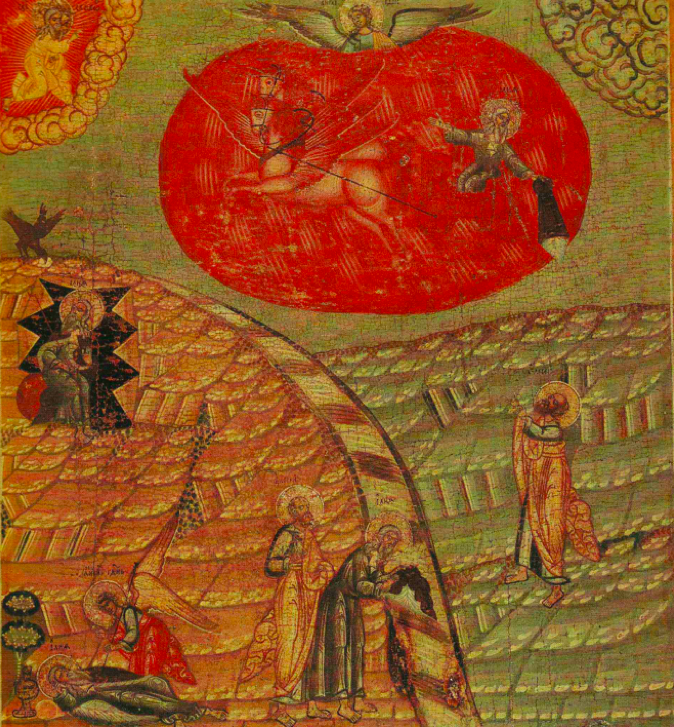 Called Sion in the Book of Hebrews, according to the teachings of Jesus, it is inhabited by “angels gathered in joyful assembly and just humans made perfect”. This means these are humans who have completed the process of ascension and have attained their non-physical light bodies or bodies of celestial flesh. My work seeks to discover what they knew and how they ascended from 3D to 5D. 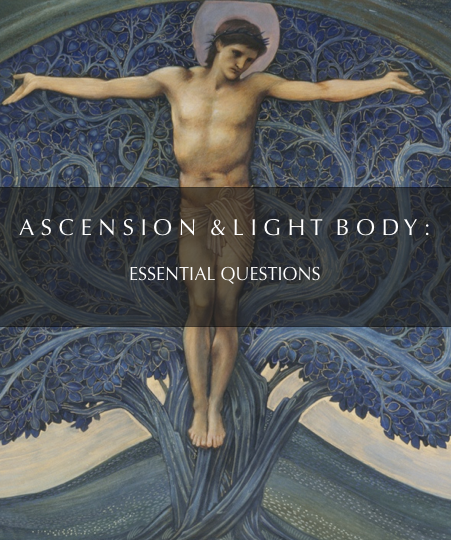 The Secret of Sion and Lost Secrets of the Watchers: Ascension, Resurrection and Perfection are devoted to exploring the ‘how to’ of ascension. We are living in the midst of a technological change that will fundamentally alter the way humans live for generations to come. A new version of humanity is emerging, or rather, converging with us. One version of humanity will follow the organic ascension path of what some call the path of homo neuveau, homo cosmos, or homo luminous. Others may choose the technological path of a next human called transhumans, H+ or H 2.0. We are the ones who will decide what comes next. While there could be a convergence between technology and spirituality this would take careful leadership. With simulated or virtual reality technology we can travel into the past and into the future. We can fluidly alter our bodies. We can create any kind creature. Through mind uploading we will be able to ‘live’ permanently in this fluid, dream-like simulated reality created by artificially intelligent quantum computers. This is the technological version of ascension. Facebook “Spaces” is a primitive version of this. Users are creating cartoon versions of themselves, called “avatars”, to interact with other avatars online. From time to time, developers promise, we may seek to leave this dream world and upload ourselves to a new physical body in the ‘real’ 3D world. The risk is that the ‘souls’ living in the fake world would not be fully aware or would forget that they are living in a simulation. Some mischievous overlord — whether alien or artificial intelligence, let’s say — could trap them in this ‘pit’ or new ‘Garden of Eden’ forever. Oh, and there could be an infinite number of simulated universes. We may even be living in one already. On some level, yes. It is a natural evolutionary process. For one reason it, basically, says one does not have to do anything to ascend and that, no matter what kind of person one is or what one has done in their life, they will automatically and spontaneously ascend. I mean, why should we bother to do anything at all to improve ourselves spiritually if the Sun will do it all for us (just as Christians believe that Christ, the Son, will ‘do’ our ascension for us)? While this is hopeful thinking, it does not make spiritual sense to me. Flow, trust, love, synchronicity, miracles, generosity, compassion and service. These are the hallmarks of ascended beings. Focus on developing these abilities and ascension automatically follows. 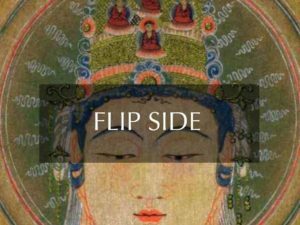 Buddhists teach the six perfections: generosity, morality, patience, making an heroic effort at self-realization/ascension, right meditation, right energy. If we can consistently live this way we are ascending. Dear Douglas, I agree with You, ascension can happen individually at any time, but only if that individual made the work, it can not happen, just because of the desire or intent…until one is human, which means having human thought process and human emotions… for example human emotions is just a electro-magnetic force that just like a rock holding the one to the bottom of the ocean… one can only ascend by letting that rock go… which means letting go of the force, emotion, which is energy in staces…People need knowledge, what is the difference between human emotions and higher love radiation and vision. Human emotions is polarity based movement, it is always along and holding to the bottom level of frequencies. To be able of controlling every thought and emotion and be able to harmonize any disruptive emotion in few seconds is something that takes life long work. people sadly judge every one and every step of their life… single eye is only seeing at the core of every being and thing God! I love your work William. I followed your Arcanum series on Gaia last year and found it fascinating. (I was living in Sweden then but now back in the UK) The phenomenon you experienced in the tomb of Sekmeht with your mobile phone was evident of a greater force at work. Thankyou for all the interesting videos. It is very true, that pure and kind heart is the beginning of the Ascension Journey. Real Journey takes time, during which the body transmutes, which is… to say painful… to say nothing at all. Only the Ones who have been through such transmutation know this process. And because no one steps in and talks about it, it means only the ones who truly desire to ascend receive the instruction from their Higher Self and Masters. Do people really want to ascend? That is the question… sadly life on Earth is still about bodily pleasures and human emotions. Even if people be told the secrets… will they use them? or just stone the messenger? William explains really nice about next step,- diamond body, glory body, light body… I just wished to bring some details. It is a gift! Once you arrive, the cherubim/airavata are there to see to your purity, and if your personal heart work is not complete you will not pass further to the light, hence it is a gift to all including self trying to ascend if the gatekeepers let you continue on to the glory of the light. Its not for all and it doesn’t happen because you so wish to do it, that is ego talking, opposite of empathy love and compassion. or better its like law of attraction, and as you ascend higher its as if your frequency starts resonating, and you are like a small grain of light resonating in waves corresponding to the whole which in of itself is made up enmasse of corresponding grains/stars of light that in the dark look like one, united, harmonious, unified glory. So sorry bud, but its a gift as much as you think you are alone in the heartwork part. The heartwork part entails patience, love, tolerance, compassion, empathy, but not alone, but really to our current moment w the ppl around us in the now. And yes Moses ascended and became a Christ according to the christian speak, so did the 1st christian martyr St. Stephen, its why they stoned him to death, for he carried on the same conversation as Yeshuwa/Jesus did, Stephen means crown in greek, and was picked from seven to face the sanhedrin before stoning judgement. What Stephen proved to sanhedrin, was that Yeshuwa/Jesus was vessel/conduit to/of the light and when gone, the same voice spoke through/to Stephen. Did not yeshuwa/Jesus say “i am not the 1st and will not be the last”. John the Baptist never became a Christ. But recognized it the moment he witnessed it. John was a Aaron priest. The rules were quite strict as to his possible parametres. He went awol from his duties due to his rebellion towards the very orthodoxy of the priesthood, but still believed that it was possible to ascend even though it had lost itself amongst the jews as it did earlier with the egyptians, hence the ‘baptise w fire’, for Yeshuwa/Jesus had managed to ascend thru the old rites of Moses n all. Moses and upto 70 around him managed to ascend together all at once and enter that light loki at the top of the mountain according to exodus……. Beautifully written and illustrated. I think this might be the most comprehensive, yet succinct, article about Ascension that I’ve come across. Thank you.